This is probably one of those times when you want to buy real buttermilk. 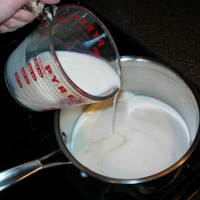 You can try substituting the vinegar and milk combo, but it won't end up as thick. 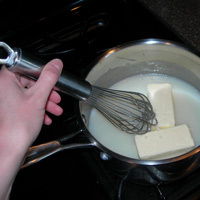 Combine 1 C butter, 1 C buttermilk, and 2 C sugar. You don't need to pre-melt the butter. Just throw it in there. I told you this was easy. Bring it all to a boil. Off the heat, add 1/2 t baking soda. It will bubble up, so make sure you have space in your bowl. 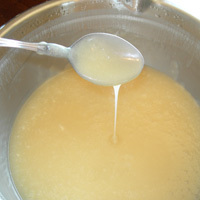 Now add 1 t vanilla and stir it all together. 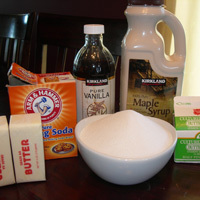 You can use 1 t maple flavoring or 2 T pure Maple syrup to finish it off. I like the real deal, but it's up to you. 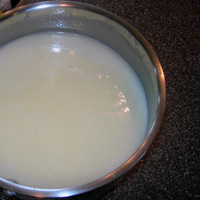 Refrigerate for at least 2 hours to let it thicken and develop some color. Serve at room temperature or pop it in the microwave for a few seconds. And Here it is frozen. Still drizzles. Notes: This freezes very well for up to 3 months. You can even scoup out a little bit for breakfast when it is frozen because it doesn't freeze solid. Pretty nifty. 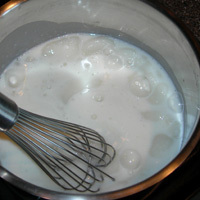 Combine 1 C butter, 1 C buttermilk, and 2 C sugar. You don't need to pre-melt the butter. Just throw it in there. Bring it all to a boil. Off the heat, add 1/2 t baking soda. It will bubble up, so make sure you have space in your bowl. 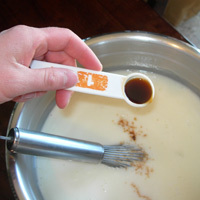 Add 1 t vanilla and stir it all together. You can use 1 t Maple Flavoring or 2 T pure Maple syrup to finish it off. I like the real deal, but it's up to you. 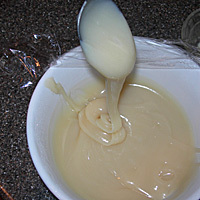 Refrigerate for at least 2 hours to let it thicken and develop some color. Serve at room temperature or pop it in the microwave for a few seconds.